In an era when traditional advertising is becoming fragmented and losing impact, the outdoor medium continues to grow. For an increasingly mobile society, outdoor advertising is an important means of connecting and communicating. The more time consumers spend away from home on the road, the more they see outdoor advertising. Their commutes to and from work, shopping, etc. give outdoor advertisers a captive audience. As drivers and passengers follow the same routes daily, they can’t help but see your message again and again, building frequency and impact. Unlike TV, radio and print, which can be switched off or set aside, outdoor advertising is always working, boldly keeping your message in front of your audience. Outdoor advertising is a cost-effective buy for businesses of all sizes. In fact, its average cost of $2-$5 per thousand impressions is the lowest of all mass media. Furthermore, outdoor can be accurately targeted, allowing you to reach specific audiences. 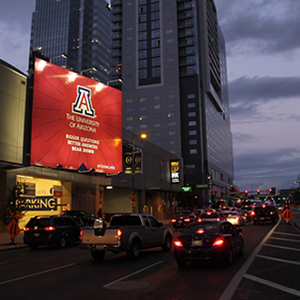 With the advent of digital displays, outdoor advertising is more flexible than ever. Messages can be changed almost instantaneously to update prices or promotions, or appeal to consumers’ different needs throughout the day. Add in the advertiser’s ability to target bulletins geographically and purchase as many or as few boards as necessary, and outdoor advertising may well be the most versatile medium of all.